Levothyroxine is a synthetic hormone used to treat people who have hypothyroidism, a condition marked by abnormally low hormone production in the thyroid gland. Calcium is a mineral sometimes used in supplemental form to treat calcium deficiency or certain specific ailments. When taken at the same time, calcium can interfere with the effects of levothyroxine and reduce this medication's treatment value. If you take levothyroxine, consult your doctor before you use any type of calcium supplement. Your thyroid gland produces two hormones -- thyroxine and triiodothyronine -- that help regulate your body's energy usage, or metabolism, by stimulating internal protein production and heightening oxygen use inside your cells. Certain thyroid gland cells also produce another hormone, called calcitonin, which works in combination with a hormone from your parathyroid gland to control your body's levels of calcium. If your thyroid gland doesn't produce enough hormones, you can develop symptoms that include weight gain, lack of energy, increased cold sensitivity, slowed speech, inadequate growth, hair loss and thickened, dry skin. 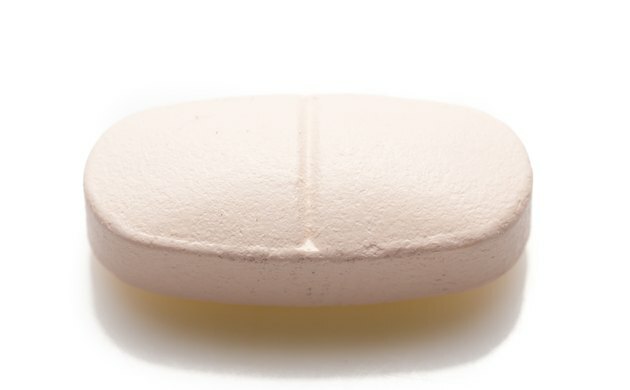 Some people who take calcium or a calcium-containing product while taking levothyroxine experience a drop in levothyroxine availability as high as 33 percent, according to Drugs.com. While no one knows exactly why this occurs, it appears that levothyroxine molecules can cling to calcium molecules and form an unmixed substance that cannot be easily absorbed in your digestive tract. In addition to reduced levothyroxine availability, people who take calcium and levothyroxine simultaneously can develop reduced levels of thyroxine and a pituitary gland hormone called thyroid-stimulating hormone, or TSH, which "tells" your thyroid gland when to produce more hormones. Reductions in levothyroxine availability appear to occur when you take this medication and calcium within a span of four hours, the authors of a study published in 2008 in "Canadian Family Physician" report. To avoid any potential for problems, your doctor will likely advise you to avoid taking any calcium-containing product in the four hours preceding or following your scheduled intake of levothyroxine. If you have a malabsorption disorder or any type of gastrointestinal disorder, the interaction triggered by close or simultaneous use of levothyroxine and calcium can potentially increase your risks for developing hypothyroidism. Some people undergoing treatment for thyroid cancer, or a disorder called nodular thyroid disease, take levothyroxine to suppress the production of thyroid-stimulating hormone. In some cases, people who receive this type of treatment have increased risks for the onset of the brittle bone disease osteoporosis, the authors of the study in "Canadian Family Physician" note. In these circumstances, calcium supplementation used to reduce osteoporosis risks can also lead to reduced levothyroxine availability. Consult your doctor for more information on calcium's effects on levothyroxine. Can I Take Calcium While on Cipro?